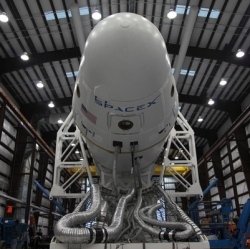 "We really feel at SpaceX that the competition is going to be the Chinese space program," Adam Harris (Spacex VP government affairs) said last month during a panel discussion at the American Institute of Aeronautics and Astronautics’ Space 2013 conference in San Diego. The U.S. responsible for just two of the 38 commercial space launches that took place in 2011 and 2012. Spacex currently has more than 50 missions worth nearly $5 billion on its launch manifest, Harris said, adding that the U.S. government accounts for just 32 percent of that manifest. The biggest threat to SpaceX’s continued success in signing up customers over the long haul is likely not the Ariane 5 or the Proton, Harris said, but Chinese vehicles such as the Long March rocket family. China’s space plans are indeed ambitious. For example, Chinese officials have said they want to return lunar samples to Earth with a robotic spacecraft by 2016 or so. They also hope to have a manned, 60-ton space station up and running by 2020, and to put a "taikonaut" on the moon shortly thereafter.